Katherine M. Clark acknowledged the dysfunction in the capital, but said she is determined to fight for the causes she believes in. 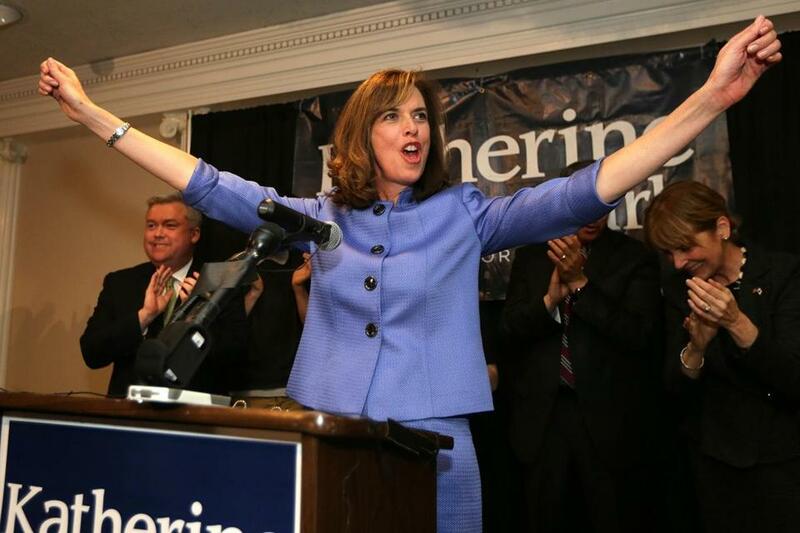 Democrat Katherine M. Clark cruised to victory Tuesday, capturing the congressional seat long held by Edward J. Markey, in a lightly contested special election that drew the lowest voter turnout of any recent US House race in Massachusetts. Clark will become just the fifth woman to represent the state in the US House, where women hold 18 percent of the 435 seats. Turnout was a dismal 13 percent, which appeared to set a record for voter apathy in the state’s recent US House races. The previous low-water mark was the October 2001 special election that Stephen F. Lynch won with a 17 percent turnout. Clark, a state senator from Melrose, won 40,172 votes, or 66 percent, easily defeating Frank J. Addivinola Jr., a Republican who had 19,319 votes, or 32 percent, for the seat from the Fifth Congressional District. Independents James Hall and James Aulenti each registered in low single digits. Clark could be sworn in Thursday, as the least senior member of the minority party in a deeply polarized House and a Congress that will almost certainly go down as the least productive in modern history. In Washington, she has vowed to fight “extremist Republicans” on issues such as pay equity for women and abortion rights, but will face a daunting challenge, since the GOP controls both the chamber and the agenda in the House. At her victory party Tuesday night in Stoneham, Clark acknowledged the dysfunction in the capital, but said she is determined to try to combat climate change, toughen gun laws, and fend off proposed cuts to Social Security and Medicare. Tuesday’s outcome was never seriously in doubt, since the district is heavily Democratic and favored President Obama over Mitt Romney by more than 30 percentage points in 2012. Clark was backed by her party, as well as unions and women’s groups, and raised $1.2 million. The state and national Republican parties had all but ceded the race to Clark, giving no financial help to Addivinola, a Boston lawyer who has run for office three times and does not live in the district. He raised $38,000 while loaning himself nearly $62,000. Born and raised in New Haven, Clark, 50, is a graduate of St. Lawrence University and of Cornell Law School. She worked for a large law firm in Chicago and in the office of the Colorado attorney general before moving to Massachusetts in 1995 to attend the Kennedy School of Government. Since then, she has worked primarily as a public-sector lawyer, in the Massachusetts Office of Child Care Services and in the office of Attorney General Martha Coakley. She was elected to the Massachusetts House in 2008 and won a state Senate seat in 2010. Perhaps her biggest legislative achievement is a 2011 law she cosponsored that made public employees work longer for fewer benefits in an effort to shrink an estimated $20 billion unfunded liability in the state pension system. Clark argued the cuts would ensure that the pension system remains solvent for future generations. She points to Senator Elizabeth Warren as a model of how she hopes to operate in Congress, fighting for liberal priorities. But she said she also believes she can work with the GOP on legislation to spur private-sector investment in energy-efficient buildings. Mickey Edwards, a former Republican congressman for Oklahoma, said Clark can be effective, if she is willing to work across the aisle and form relationships with Republicans, in the tradition of Thomas P. O’Neill Jr. and J. Joseph Moakley, two legendary Massachusetts Democrats. “If you go there just to be another hard-line Democrat or another hard-line Republican, there to do battle with the other side, you’re meaningless,” Edwards said. “The whole place is filled with people like that. member congressional delegation, joining Warren and Representative Niki Tsongas, Democrat of Lowell. That is the most women ever to represent the state at one time. Clark will be the 79th woman in the House.